I have seen it happen that the sole contact information for some conferences is an email address, or sometimes just a "contact us" form on a website (for example, many conferences organized via Eventbrite). No address, no phone number. I am planning on attending such a conference, but haven't made any travel plans yet (no flight or hotel bookings). I can make a stab at the city and state based on the location of the event, but what do I do about the street address and phone number? Can I abuse the venue's address and phone number? Should I ask friends in the US for their contact information (though there might be no one who lives near where I plan to go)? My previous visa application went through a 221(g) letter and administrative processing to end up with a 1-year-validity visa that expired recently. I'm applying for a new one (since the renewal process states that those with "clearance received" on their previous visa have to do so). I am required to give the name of a contact or organization and a phone number, but I am not visiting anyone in the U.S. If you do not know anyone personally you may give the name of the hotel, company or organization you intend to visit. If the question does not apply in your case, you may simply state “does not apply”. If you are in transit to a non-U.S. destination, please write “Transit”. Most fields are mandatory and must be completed. The form will not allow you to submit an application with mandatory fields that are left blank. You will receive an error message and will be required to complete the field before continuing. 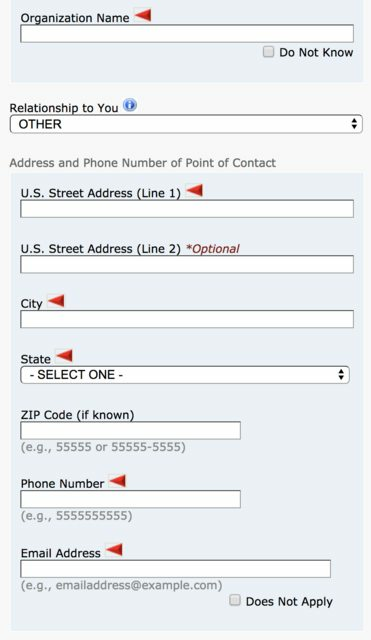 The fields marked “optional” may be may be left blank, and the fields that give the option to select “Does not Apply” may be ticked if the information does not apply to you. The purpose of wanting the contact information for the conference is so that immigration can check that the event is a legitimate one, and not just one organized for the purpose of inviting people to the US (or just a few people getting together in a bar). If the only way of contacting conference organizers is through an email then there is a high risk (from the point of view of immigration officials) that the conference is not in fact legitimate. If it was organized entirely through Eventbrite (a site which anyone can use to create any event) that raises even more doubts about the conference's legitimacy. Pretty much every legitimate conference will be run by a corporation (which must be law have a mailing address), have a website, a phone number and a street address for deliveries. Many people visit the US without knowing anyone there, and in that case it is permitted to write "not applicable" or to give the contact info of the hotel you will be staying at. However if you claim to be attending a conference but are unable to provide contact information for it then you are increasing the chances your visa will be rejected. In this case, I ended up googling for the organising company's information (and found some on a US state's website for looking up registered corporations). I filled in 0s for the phone number. In the end, I don't know if it mattered in my case. The interviewer made no mention of it, the application went to administrative processing and I got a 1-year visa about 6 weeks later.